I think i’ll wait for the ECM! Hopefully it shows something similar. You've asked this question on every single event the last few years, and you always get the same answer of "that's a ridiculous question". Honestly, do you think we're going to magically be able to tell you something different this time or are you just trolling? I don't think it matters too much. The exact tracking of this low is still up in the air. I think it will be tomorrow sometime before we get a better idea of where it's going to make it's impact. Exciting model watching over the next few days. Regardless of the track of the low, the airmass looks too modified for anything of note, away from hills and mountains. Putting this week to one side the met office are bullish of a cold/very cold February. What’s your thinking on this? The eagle on radio 1 just said plenty off snow showers for the West and northwest monday nite and Tuesday. ECM bringing that shortwave to our south that bit closer on Tuesday. Be interesting to see how the frontal zone lies there. As Gonzo mentioned could be a more significant snow risk here. in general, do we tend to get much from these ''channel low'' events that the UKMO, GFS/P and ECM seem to be all in agreement about now at 72hrs? Netweather is very excited about it as the south there should do well enough, but im assuming we dont usually do very well out of them and if we did it would be the far south coast of Ireland? ECM bringing the precipitation well north from that system Monday night. Definite snow risk over the vast bulk of the country. ICON very similar to the ECM. Big change for us for Tuesday morning in particular. And with winds off shore in the east we are in the zone as well. Nice to ECM showing a bit of potential. GFS snow charts are worthless unless temps are -8 or below on other models (really we want -10 on GFS). It's shown snow so many times where none has materialised, in my location at least, enough times now to lose count. And that's just this season! HIRLAM, when in range, has been very accurate for precipitation type, especially in big bands. Less show in showers and location of showers, but these are much harder for any model to predict exactly. Last edited by sdanseo; 26-01-2019 at 18:58. 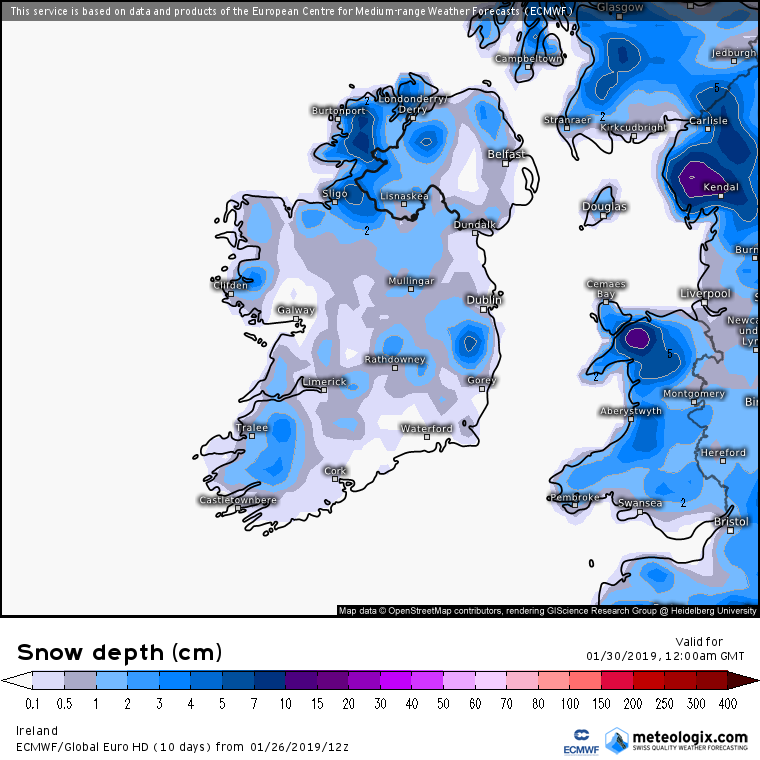 ECM snow depth for midnight Tuesday. Looks about right to me, ie. accumulations mainly on higher ground above 300m. I'd imagine many will see snow falling over the next few days but accumulations at low levels will only be temporary under heavier falls. The usual Atlantic stuff, but I'll take it over nothing. A family funeral has arisen in Duncannon, South Wexford that will take place on Tuesday lunchtime. We'll be driving from home in Dublin, down and back same day. Thoughts about potential travel disruption? Or is my thinking correct that it'll be very windy, cold and miserable with irritating squally mixed precip that is unlikely to affect the roads on my route?